I’m excited to present our first Curbside Consult video interview. In these videos, I’m the guy in the little window at the bottom left. The bearded guy occupying most of the screen is the great Aaron Carroll. Aaron is a pediatrician and health services researcher at the University of Indiana, where he directs the Center for Health Policy and Professionalism Research (CHPPR). Aaron blogs regularly at The Incidental Economist, a highly respected website that covers health policy. (I write there on the weekends, as well.) He publishes frequently in the Journal of the American Medical Association’s blog, CNN.com, and similar outlets. I admire Aaron’s clear and humane writing on a host of subjects. He’s admired across the blogosphere for his ability to use simple graphics to underscore simple but important insights one might otherwise miss. The first chart concerns changes in lifespan among American retirees since the 1970s. This is an important issue for Medicare policy. Our implicit sense that retirees live a lot longer than they used to animates proposals to raise the ages of Social Security and Medicare retirement eligibility. As Aaron demonstrated, virtually all of the recent increase in lifespan among American male retirees has actually occurred among people in the top half of the income distribution. Men within the bottom 50 percent experienced virtually no change. 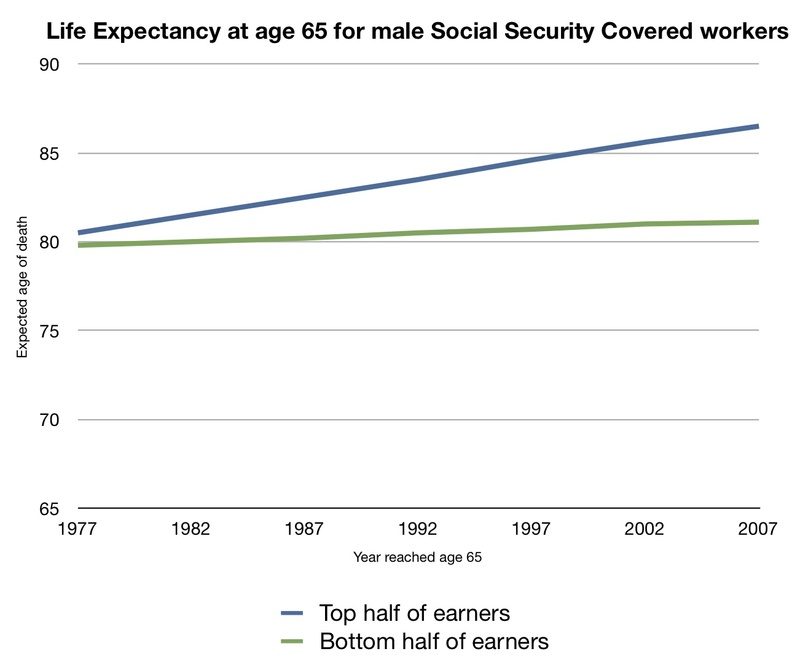 Aaron’s fans, such as Paul Krugman, noted that this chart underscored why raising the Medicare eligibility age is so misguided. The second Aaron-chart is more fun. It illustrates the proportion of Canadians who migrate to the U.S. to receive health care. I won’t spoil it. I’ll just say that, yeah, it’s a tiny proportion. We get on to some related subjects, in which vivid but unlikely possibilities unduly sway people’s behavior on subjects ranging from the flu to home gun safety. In Part Two of our interview, we talk about the road ahead for health reform and in particular, what’s ahead for the state health insurance exchanges. We talk about the expansion of Medicaid and why states are likely to ultimately accept the expansion. Aaron explains why the insurance industry won’t stand in the way of the reform law, and why doctors will welcome an expansion of Medicaid. And, while governors may sit back and let the federal government drive at the launch of the state health insurance exchanges, he says, they are likely to quickly take the wheel when the exchanges start rolling. Incidental Economist blogger Aaron Carroll talks about the road ahead for the ACA and its state exchanges.